Itchy scalp and hair loss can be very frustrating and worrying, and there can be a number of factors which cause or aggravate the hair loss. The hair loss caused by itchy scalp problems is not always permanent, and will often grow back once the main itchy scalp problem is sorted out. In saying this though, it is vital that you take swift action to properly diagnose the problem and search for suitable remedies and treatments in order to avoid long term scarring from the itchy scalp irritation, and thus enable your hair to begin growing back. 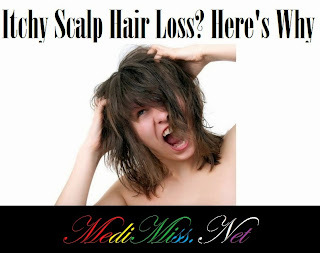 Here I'd like to tell you about a few common reasons for itchy scalp hair loss and what you can do to alleviate the problem. Folliculitis - strong ingredients in shampoos can damage hair follicles and lead to infections such as folliculitis. Symptoms are normally small, white-headed pimples around one or more hair follicles. Deep folliculitis will often result in larger painful red boils. If left untreated the folliculitis can significantly injure the hair follicle resulting in localised areas of scarring and bald patches where there are no visible follicles; this is known as "cicatricial alopecia". Antibiotics are often used to treat folliculitis, but as with all antibiotics they can lead to a resistance to the antibiotic used. Natural remedies containing Tea Tree Oil or Lavender Oil can be extremely effective in treating the itchy scalp hair loss of folliculitis, particularly in the early stages, and can help to stimulate hair growth. Ringworm of the scalp (tinea capitis) - a superficial fungal infection of the scalp. It is caused by mold-like fungi called dermatophytes, and the symptoms include red, itchy patches on the scalp, hair loss and, if left untreated, can also lead to cicatricial alopecia. The skin might peel or scale and be red and itchy, with swollen blisters or a rash (that can spread) that appears as black dots. The rash, being highly contagious, is normally treated with over the counter products containing miconazole, clotrimazole, or similar ingredients. Sometimes prescription medications are needed to clear it up. There are many natural products that can be used to aid the healing process and act as natural antibiotics, but it must be stressed that ringworm is an aggressive fungus requiring close monitoring and appropriate treatment. Psoriasis - said to affect some 2.5% of the US population (about 7 or 8 million people) psoriasis is a fairly common, non-contagious skin disease in which the skin cells replace themselves too quickly and cause red lesions covered with scale to appear. Scalp psoriasis is said to affect at least half of all psoriasis sufferers and is characterized by white scales on patches of very red skin, often accompanied by severe itching and possibly temporary baldness on the affected areas. Using a shampoo containing zinc pyrithione (in its natural form) can be extremely effective at combating psoriasis and itchy scalp hair loss in general, as it has very strong anti-fungal and anti-bacterial properties. Home remedies using birch or avocado oil are also extremely effective in soothing and healing psoriasis. Seborrhoeic dermatitis - similar in appearance to eczema (Atopic Dermatitis), this is an inflammatory reaction to the proliferation of a yeast called Malassezia (or Pityrosporum Ovale). It produces toxic substances that irritate the skin. This yeast is always present on the scalp in small numbers and feeds on the natural oils produced there. Imbalances in the levels of oils (sebum) on the scalp, (often due to harsh shampoos, conditioners and hair dyes) can cause the yeast to multiply and grow, resulting in dry redness, flaking, itchy scalp and sometimes cause temporary hair loss. The flakes of skin are normally characterized by a yellowish colour and oily texture. Since the dermatitis is generally caused by the use of harsh shampoos and the stripping and drying out of the scalp, it is advisable to use a shampoo containing only natural ingredients like Tea Tree Oil which will not only help to fight the infection but will control the yeast and condition the skin, as well as maintain the natural pH balance of the scalp. Adding Rosemary Oil to the shampoo can work wonders, in addition to using simple home remedies containing Manuka or Tea Tree Oil, as well as Lavender to stimulate hair growth.